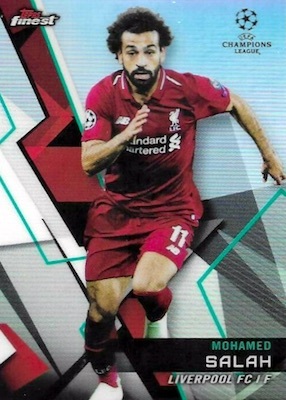 It's only appropriate that the finest club competition in the world is available in 2018-19 Topps Finest UEFA Champions League Soccer. The annual European tournament has seen an uptick in card coverage but the 2019 release offers the first showcasing the Finest stylings. 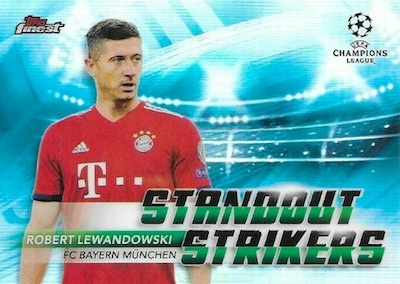 The UCL Hobby boxes utilize a format that includes one autograph per mini-box and two per master box. 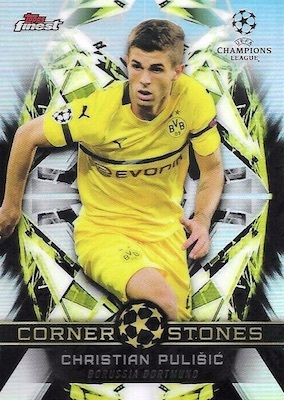 Carried over from the 2018 MLB set, the abstract base design in 2018-19 Topps Finest UEFA Champions League Soccer adds several Refractor parallels. This includes base Refractors at 1:3 packs, plus Purple (#/250), Blue (#/150), Green (#/99), Gold (#/50), Orange (#/25), Red (#/5) and SuperFractor (1/1) editions. In addition to the 100-card base set, there is an Extended Base Set covering those names not found in the main lineup. These have only Gold (#/50), Red (#/5) and SuperFractor (1/1) parallels. 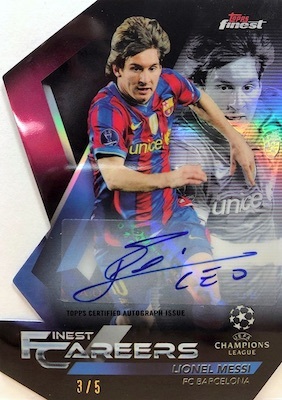 Global soccer stars are also treated to a variety of inserts in the 2018-19 Topps Finest UEFA Champions League checklist. Finest Cornerstones identifies the player that helps anchor the team, while Standout Strikers centers on the prolific scorers. The Finest Careers set is another choice but the 10-card selection is limited to just one player. 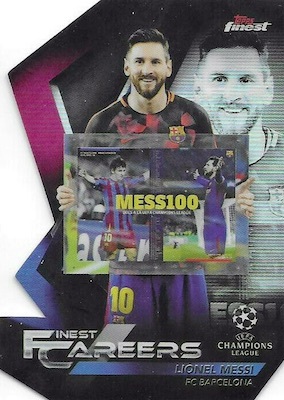 Every card in the die-cut set showcases Lionel Messi from his UCL career. Each insert also comes in Gold (#/50), Red (#/5) and SuperFractor (1/1) parallels. Teasing some big names, the Finest Autographs line borrows the base design and adds a signature. Refractor parallels here include Blue (#/150), Green (#/99), Green Wave (#/99), Gold (#/50), Orange (#/25), Orange Wave (#/25), Red (#/5), Red Wave (#/5), and SuperFractor (1/1). Collectors can also find Extended Base Set Autographs. However, these are more limited with only a numbered primary version and a one-of-one SuperFractor. Finally, each insert works in a signed version. 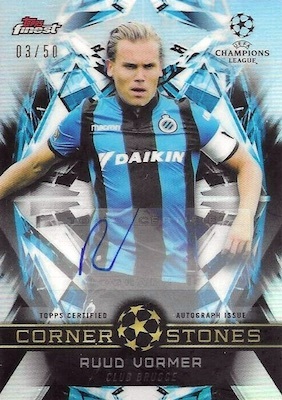 The selection consists of Finest Careers Autographs, Finest Cornerstones Autographs and Standout Strikers Autographs. These, too, only have a numbered base version and SuperFractor (1/1) parallel. 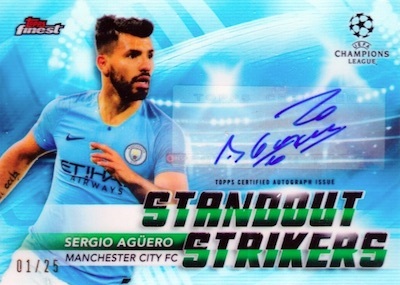 Buy 2018-19 Finest UCL boxes direct from Topps. REFRACTOR PARALLELS: Base Refractor (1:3 packs), Purple #/250, Blue #/150, Green #/99, Gold #/50, Orange #/25, Red #/5, SuperFractor 1/1. 2 Sergio Ramos - Real Madrid C.F. 3 Gareth Bale - Real Madrid C.F. 47 Marcelo - Real Madrid C.F. 61 Isco - Real Madrid C.F. 95 Toni Kroos - Real Madrid C.F. 106 Karim Benzema - Real Madrid C.F. 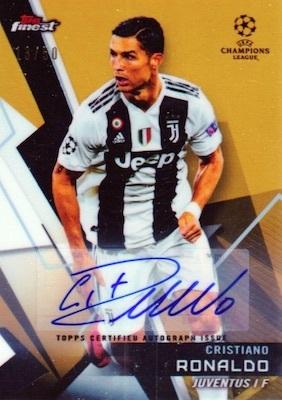 Buy 2018-19 UEFA UCL autographs on eBay. FC-I Isco - Real Madrid C.F. SS-GB Gareth Bale - Real Madrid C.F. View 2018-19 Finest Champions League Soccer checklist Excel spreadsheet.